Decoding audio sounds, representing single letters, tested on audio captchas. Segmentation of audio signal to single letter sounds (now very simple based on signal power level). Train the classifier using it's training tools (easy.py will do all the work). 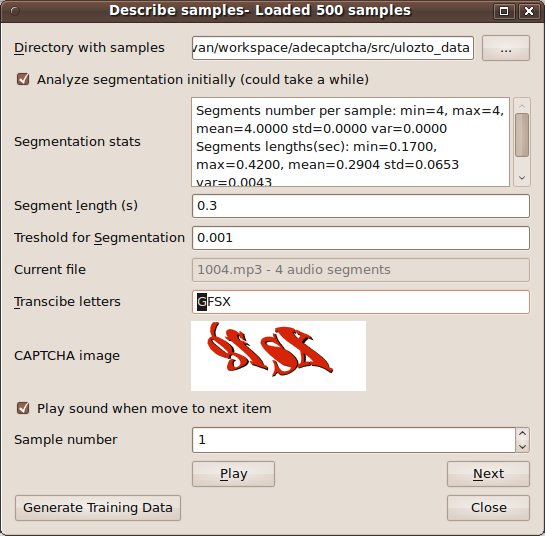 Create configuration file which referes classifier model, scaling data and couple of other parameters from training process (especially fixed sound duration for a single letter and relative power level for sound segmentation). Developed and tested on Ubuntu 9.10 64 bit. Not sure about other platforms. Requires: numpy, scipy, pymad, pyao, pyqt4 - all are available as packages in Ubuntu. Source (including libsvm and talkbox) is available from launchpad here. Contains also some test and training data. SVM library and tools are compiled here for 64bit linux platform. If not right for you, you need to compile libsvm yourself.